On the descent from the escarpment the scrub crowds in, the sand deepens, tree roots and the occasional drift of rock add to the chance of a puncture. Our first glimpse of the water is between 60m dunes, the sand deeper and softer here. Our truck turns into a roller coaster, the steeper crests topped with slats of wood tied together and laid across the track to help with traction. Many of the connections are broken, with some slats impaled in a mess of white sand. Finally along the beach we choose a path just above the waterline, the tide retreating for the next couple of hours. We pass the sacred site of Twin Eagles, impressive pieces of rock joined to the mainland by sandbars. This is a mystical coast, isolated, grand, often wild and windswept. 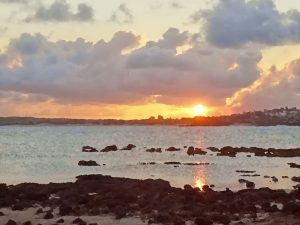 Our camp lay between stands of bull oaks where the slightest breeze sounds like the rush of a river, the ocean waves a constant wash, a timeless ebb and flow. A pair of osprey fish just offshore and sooty oyster catchers wander the wet sand. There are dingo footprints for the length of the beach. They seem small and delicate, their direction straight. On our first night any breeze is soon gone, the sea a breathing lullaby, the early evening a welcome relief from the normally sweltering sun. The full moon is late rising, finally lighting the dark, hilly landscape where our truck is nestled. The next morning we lay low in the shallows, the tide out, the sun already hot. There is no sign of crocs. The dingo approaches from the fisherman’s camp, stops and stares, not five metres away… then takes a measured step even closer, her delicate front paws now in the water. She’s young, this one, with a fine white muzzle and black nose. I can see her ribs, but her sand-red coat is clean, unmarked by mange or scars. Her tail is bushy. She sniffs the air and stares, alert, her ears pointed, erect and listening, eyebrows white, those eyes wary, brown and questioning, “Are they dangerous? Are they food… maybe some beached animal that could be dinner?” Her cautious curiosity is tangible, before she finally turns, gives us one last look, then resumes her business-like trot, off and down the beach before turning at some rocks, then disappearing up into the piles of white, windswept dunes. Tufts of grass are still, the hot air stifling. That night we drink in a balmy breeze and cook pork on the campfire, the fireplace a rusted steel ring in the sand, our burning logs within, half the top a cast steel grate. Early next morning we finish coffee, and there is a movement in the corner of my eye. Then all is still by the makeshift BBQ. She stands like a statue, neck stretched and nose towards the now cold grill, those eyes watching us. But the pork steaks are long gone, just a memory of last night’s dinner with a bottle of Italian red wine, a dash of garlic and a kale salad with shredded Parmesan cheese. But it seems those eyes are accustomed to disappointment, and we wonder if there are pups secreted away in a den up the beach. We offer no scraps, and life seems tough for a beautiful animal that has walked these ancient sands for over 4000 years. Glad you enjoyed the memories. Nice story Ian….Dingoes are very curious but shy. They cause no damage, they are vital for our ecosystems to keep a natural healthy balance. Thanks for reading Jenny-Lee, & for the kind words. 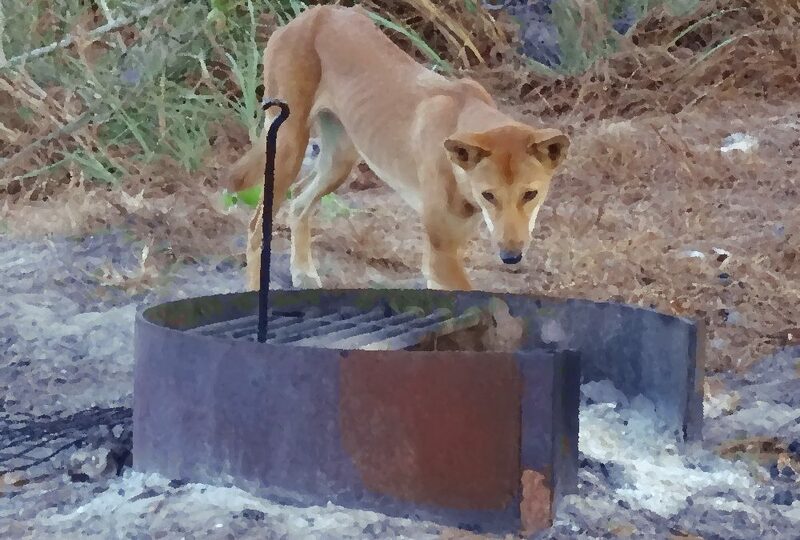 Having met dingoes in the middle of nowhere more than once, I do consider myself lucky. What can I say, brings back memories of years gone by, beautiful. Yeah, still an amazing place up there, & I definitely have a soft spot for a dingo.